There will never be a better time than now for us to get our act together. In the last chapter (C.C. No. 73) of The White Man`s Bible is listed a number of alibis our White Racial Comrades repeatedly put forth in order to avoid, evade, or procrastinate coming to grips with the dire dilemma in which the White Race is now unwittingly embroiled. That the White Race is in a horrible mess and will soon be liquidated as a biological species, of that there is hardly any doubt by any thinking White Man who has studied the situation. That the Jewish establishment is now in a powerful position to destroy the White Race, is fanatically bent on doing so, and is escalating its fury into an ever increasing crescendo, that, too, can hardly be argued. That in Creativity we already have the vehicle, the creed and the programme with which to solve the problem conclusively and with crashing finally, that, too is accepted by most of our supporters. Then what is the problem ? The biggest problem we have encountered is the apathy and the alibis people will come up with in lieu of taking militant, meaningful action. In C.C. No. 73 is listed a number of them and also drawn a picture of the consequences if we don’t soon get our act together. The White Race need a dire disaster to strike them before they will wake up. They still have it too good. Everybody is eating well, nobody is starving, and if they can’t or won’t work, they can always go on welfare and the government will feed them. As long as they have their beer and TV they are beyond reach and won’t listen to any warnings of the impending collapse and disaster. It is after the system has collapsed, when there is hunger and famine, when there is a major race war sweeping the country and blood flowing in the streets, Then, yes then, and only then, will the White Race wake up, see the light and take drastic action to purge the enemy. So the argument goes. There is a part of this argument with which I wholly agree, and that is that there will be blood flowing in the streets, and in large quantities. There will be a racial war, and the prime target will be the White Race. I believe this because every evidence indicates that the Jews have planned such a bloodbath for Whites, as they have ruthlessly unleashed in many countries over the many centuries. I am convinced that it will happen. I am convinced they will unleash it as soon as they have flooded countries with enough hostile dark races, a process that is accelerating with all the deliberate speed the Jews can muster. 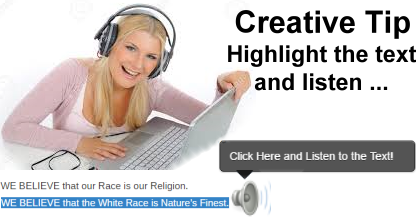 When the White Race is weak, confused and vulnerable enough, the Jews will unleash their fury and attempt to wipe out Nature’s Finest – the White Race. However, the rest of the argument is totally false, By the time the scenario of blood flowing in the streets comes to pass it will be much too late. In fact, it recalls to me a vivid picture of the sad fate of the roosters when I (Ben Klassen) was still a kid on the farm in Saskatchewan. Often on Sundays we would enjoy a chicken dinner. Since we raised our own chickens, all we had to do was catch one of them, usually a rooster, lay its head on a chopping block, take an ax and chop its head off. That was when the action started. Whoever did the chopping would quickly toss the bird to the ground and quickly get away from it, since blood would spurt out of its neck profusely and the bird would flap into a violent convulsive reaction, aimlessly flopping and floundering about, flailing its wings until in a minute or two it had bled to death, and it was all over. Now this is not a pretty picture, but I warn you, it represents fairly accurately a picture of the kind of fate the White Race can expect if it is passively going to sit on its big fat apathy and wait “until there is blood flowing in the streets”, before the White people will wake up and take action, When I say this I am not just postulating a theory, I am speaking from the experience of history, from my own personal experience in Russia, and from that of my family. My father was born into a peaceful, thriving Mennonite colony, as was his father and as were his grandparents. It was located in a fertile area on the Molotechna River in the southern Ukraine. It was pioneered by my Mennonite ancestors starting at about 1804. Since the Mennonites were industrious, hard working and frugal, the colony prospered beautifully and by the beginning of World War I it consisted of about 30,000 happy and prosperous members sequestered in approximately 50 towns and villages. There were at the beginning of the 20th century approximately six million Jews in Russia, seething with hate, rebellion and conspiracy to overthrow the Russian government and the Romanov dynasty. For centuries they had been plotting, organizing and conspiring to bring down the whole social structure, institute a massive blood bath, kill off the best, especially the White Russians, and enslave the entire population. Vengeance ! They wanted to wreak vengeance on their enemies ! And who were their enemies ? Why, the whole world that stood in their path of world conquest. When the Russian armies collapsed in 1917 while WW I was still in progress, the Jews in Russia were ready. With the help of their racial kinsmen in the United States and throughout the world, they unleashed revolution, anarchy, famine and the greatest blood bath (up to that time) in history. Thirty million White Russians, all of Russia’s finest, the aristocracy, the intellectuals, the pillars of society, they all fell in a hail of Jewish bullets, in one massive bloodletting operation. Did this violent convulsion “wake up the people” ? Well, it did not wake up the Mennonites in the Molotechna colony, nor did it wake up the White people of Russia, as to who their real enemy was. Whereas it alarmed them into frightening despair, it did not alarm them to any constructive action. They did not organize an effective defense, nor did they find a meaningful solution. When the vicious holocaust was over (if it ever is over) the net result was 30 million White Russians dead, and the Jews with their Communist apparatus were firmly in power. Today, years later, the Jews are still firmly in power and have spread their deadly tentacles to every country in the world, in some, openly communist, in others, like the United States, deceitfully covert, but nevertheless fully and ruthlessly in power. So let us analyze this business of stupidly waiting “until there is blood flowing in the streets” before we wake up and organize the White people of the world. Did the White people of Russia understand the holocaust that had painstakingly been planned and unleashed upon them ? Did my ancestors, the Mennonites understand it ? No, they did not. Neither the Russians, nor the Mennonites, nor my living relatives understand it to this day. Instead, the “White” Russians fought the “Red” Russians. The Jews were in control of both factions while both sides slaughtered each other mercilessly. The jews mere masterfully manipulating their age old strategy of Divide And Conquer. And conquer they did. The Russian people and my Mennonite ancestors reacted just like the rooster with its head cut off. They flopped and flailed in all directions pointlessly, aimlessly and ineffectively, until they bled to death. The beautiful, prosperous Mennonite colonies were totally wiped out and their formerly thriving and happy inhabitants were either killed, shipped off to Siberia or scattered all over the face of the earth. I am one of the “scattered” who survived. When I (Ben Klassen) was born in the small Mennonite village of Rudnerweide in February of 1918, things looked extremely dismal, not only for Russia, but also for my immediate family. And they were. The “Red” Army and the “White” Army were engaged in fighting a bitter civil war, and part of it was being fought right in the backyard of our little settlement in the Southern Ukraine. Part of it was also fought right in the backyard of our home and several shells rocked our house. When I was nine months old, my mother said I came down with diphtheria or scarlet fever (I’ve forgotten which) and I nearly died. At this time the warring factions were still shelling our area and wreaking havoc, anarchy and destruction. The military actions were followed by looting, chaos and famine. During the two year famine of 1921 and 1922 five million people in the Ukraine alone died of starvation, among them many Mennonites. Today, years later, Russia is still under the vicious heel of the Jewish tyrant. I ask you a serious question — how could you go about starting a Freedom from Jewish Tyranny Movement under conditions such as existed today ? We (our family) did extricate ourselves from that horrible dilemma, and emigrated to Mexico in 1924, then to Canada in 1926. Nineteen years later I myself emigrated to the United States and prospered. I repeat, where there is life there is hope, provided you take due advantage of “the tide in the affairs of men”, to quote Shakespeare, and take direct, meaningful action. There is a powerful (if highly painful) lesson to be learned from the experience of history in even as short a period as my own lifetime. I have learned that lesson well and I have learned it the hard way. That lesson is damn simple, and it is this : Prepare to demolish your implacable enemy, the Jewish conspiracy, before your head is on the chopping block. By the time the axe comes down it is too late, like the rooster with his head cut off, once blood is flowing in the streets the White Race will be aimlessly flailing, flopping and floundering, killing each other as they painfully bleed to death. That is not the beet time to wake up and start organizing for the survival of the White Race. The beet time to do so is now. We should of course, have done it a long time ago. In recapitulating our sins of omission of what the White Race should have done, the list is endless. We could go back as far as 6000 years and say the Egyptians should have had a racial religion, which I have already said repeatedly. But all that is now water over the dam and past history, and we cannot change it. What we can and must change is the present in order to mold the future. And there is plenty we can do and must do, and there will never be a better time to do it than now. The idea that anarchy is the ideal time to wake up, organize and rally the White Race, is not borne out by history. I have already cited Russia. I can also cite Hungary, Rumania, Czechoslovakia. I can cite Angola, the Congo, Rhodesia. I can cite Lebanon. Terror, anarchy, bloodletting. Each time the Jew picked up the chips. History’s most illustrious example of a vigorous people organizing and beating the Jewish terror is Hitler’s Germany during the 1920’s and 30’s. It was not accomplished with a bloody revolution as happened in Russia in 1917. It was done by deliberate planning, by building, and by intensive organization, mostly by peaceful means. True, Germany in the 1920’s was desperate; true, conditions were somewhat chaotic; but the powerhouse Hitler built was done under conditions that were still civilized and organized. The mails were still functioning. The railroads were still running. Coal was still being systematically mined and factories were still producing goods, although lethargically, and under Jewish tutelage. But still, there was not blood flowing in the streets and there was not total anarchy. It was under at least civilized conditions that Hitler was able to build a power structure. When the Russians were sacking Berlin and the Allies were firebombing Dresden, it was no longer possible to do so. That lesson must become painfully clear to the White Race all over the world. Despite all our neglect and all our stupidities of the past, there will never be a better time to get organized, to get our act together than now. (Read again C.C. No. 73 in The White Man`s Bible). Let me reiterate, there is no magic pill, no magic formula to pull us out of our dilemma. The answer is building a powerfull racial movement that will be determined to, and can smash the Jewish power. We have the means. We have the resources and we have the power to do so. We have to make up our cotton-picking minds that we are going to do so, come hell or high water. We also have to make up our mind and decide on one exclusive vehicle that we are going to polarize around. We can no longer flop and flounder around in a hundred different directions like a chicken with its head cut off. (Read again “A Polyglot Mind” Issue No. 10 of Expanding Creativity) We have to act. We have to polarize around a racial religion and whip our own people into action, to not only avenge history’s most abominable outrage, but to organize our race into a beautiful, prosperous and healthy social structure that can thrive and prosper for the next million years. Creativity is the answer. We have the creed, the programme and the base. But without your help and determined, militant support it means nothing. We must have the activist support for our World Headquarters and we must have activist church groups springing up in your area. We must have both, dispersion and polarization. This is not a contradiction. This is survival strategy at its best, and the Jews have successfully practiced it for thousands of years. It means this : We (you) must build local church groups in your area (See Issue No. 10 of Expanding Creativity again) and grow and expand. The more such groups all over the world, the better. We must also polarize around one creed, one programme, one loyalty, just as the Jews have done. We must polarize around our own White Racial Loyalty. In Creativity we have it all – the Total Programme, the Final Solution, the Ultimate Creed, We have the whole ball of wax. Let us now dedicate ourselves to the task and get our act together. There will never, never be a better time than now. Eternal struggle is the price of survival and we had better get with it. When the axe is coming down on our necks it will be rather late. Let the Russian bloodletting experience be a lesson to us that chaos, anarchy and turmoil are not the best of times to rally the forces of the White Race. Ditto for the Jewish take over in Poland, Rumania, Czechoslovakia, Hungary, East Germany, Yugoslavia, Rhodesia, Angola and dozens of other ironclad Communist countries held in the threes of Jewish tyranny. How many times do we have to be hit over the head with a telephone pole before we learn our lesson ?